People in poor countries are particularly affected by natural disasters. The poor are the main victims of droughts, hurricanes or floods, all of which can destroy harvests, infrastructure and livelihoods, increase prices for foodstuffs, and force people to flee their homes. After a disaster hits, people and communities are often left to fend for themselves, without external support. Maintaining the status quo of reactive (ex post) response to disasters results in slow reaction times, often driven more by political will and media attention than by actual needs. This way of working is inefficient and expensive. If, in addition, man-made climate change ensures that extreme weather events occur more frequently and their destructive effects are intensified, then neither the capacities of the countries concerned, developed or not, nor the efforts of humanitarian aid are sufficient to meet these challenges. Here an old principle that applies to almost all areas of life comes into play: prevention is better than repairing the damages after the fact. But who helps finance prevention? Development assistance considers risks from the loss of crops, soil erosion or price drops. However, funds are often not available to prevent a disaster. Humanitarian aid, on the other hand, typically responds to the consequences of a disaster; usually providing immediate lifesaving aid after an earthquake, cyclone or an extreme period of drought. Government agencies, the UN, NGOs, and other local organisations usually warn of an imminent disaster weeks or even months in advance. Quite often, early warning systems and organisations like Welthungerhilfe or its partners sound the alarm in good time. However, nothing is done to address the impending crisis. No early action follows the early warning. There is not an abundance of money, and therefore no measures are taken. Particularly in the case of a slow-onset crisis such as a drought, major donors only release the necessary funds after dramatic images of starving children and dying animals reach the mainstream media, and even then, what is made available is often too little, too late. In such a scenario,early action, following early warning, would have reduced the scale of the disaster and the impact on people and livestock. crisis response up to 6 months before a traditional humanitarian response, because there is no need to wait until suffering is tangible to attract donor funds. They have been pre-committed and are available the moment the model signals a drought of a particular threshold. Forward-looking action requires contingency plans, which can be elaborated in more detailed implementation plans if the model is triggered. Activities for early action for drought could include: school meals for children, animal feed to protect livestock, and cash transfers for families to buy food. This menu of possible activities forms the basis of the Standard Operating Procedures (SOPs). Activities such as these, if provided early, can help families maintain their livelihoods in the lean season and reduce negative coping strategies such as pulling children out of school, eating seeds, and selling livestock. The main question for such intervention must be: can people still cope with the effects of a hazard and at what point is their very existence threatened? What is Welthungerhilfe doing today? A first pilot project on humanitarian adaptation to climate change was coordinated by the German Red Cross (DRK) in cooperation with Welthungerhilfe and other partners from 2015 to 2017 in the three high-risk countries of Bangladesh, Mozambique and Peru. Financial support came from the Federal Foreign Office (AA). The aim of the project was to develop special indicators for early warning and SOPs for a disaster caused by draught. To this end, the responsibilities in the respective countries were first examined, climate risk analyses prepared, existing early warning systems improved and new ones set up. The results were discussed on an international dialogue platform and serve as a basis for further projects. As a major player in humanitarian aid and development assistance, Welthungerhilfe is contributing to the much-needed paradigm shift within the humanitarian aid system. With its experience, Welthungerhilfe is currently setting up its own project in Madagascar, the first to be led by NGOs and the first to address drought. Indirectly, more than six million men, women and children on the island affected by droughts will benefit from the project, which will develop SOPs in at least three districts and establish a replicable handbook for forecast based financing of drought relief. In the south, there are classic dry zones, but more and more droughts are spreading to other regions. Welthungerhilfe works closely with the national civil protection authority and participating ministries, with universities and climate institutes, with local communities and their representatives, with European and international partners and other NGO’s. Together they will develop a mechanism that can be applied to other regions or even countries. This process demands a lot of patience, as the concept of pre-positioned finance for early action response to drought is new, and the mechanism can be difficult to understand for those who have spent their lives working in the traditional ‘reactive’ humanitarian system. Despite the efforts needed to set up this pilot and to establish FbF as a mainstream mechanism, the goal is worthwhile. From its years of experience, Welthungerhilfe knows that each euro used before an emergency is four to five times more effective than funds spent after the crisis. And, more importantly – it allows many more lives to be saved. in Germany without political or religious affiliations. rights, and should be able to control their own lives. 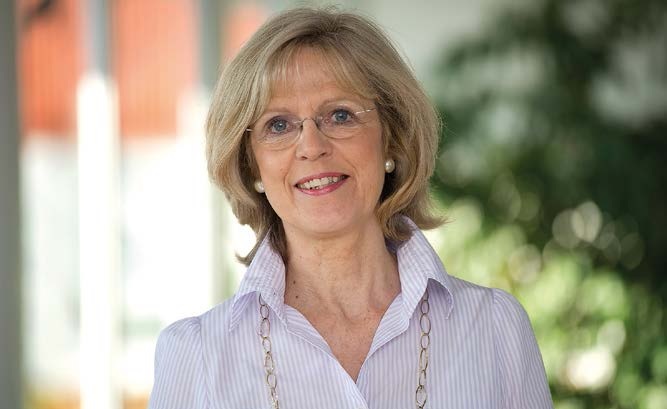 Bärbel Dieckmann has held the position of honorary president of Welthungerhilfe since 2008. She studied philosophy, history and social sciences at the University of Bonn and was a teacher between 1974 and 1995. A member of the SPD since 1972, she was a member of the party executive from 1999 to 2009. Her political activities have focused on environmental and development policy as well as youth, family welfare and education policy. Ms Dieckmann was mayor of Bonn from 1994 to 2009. Next → Next post: What are the lessons for today? Did NATO’s intervention in the Balkans work?